← DAM, Heddon, Creek Chub, Gobel & Ever Ready Lures. I have been promising various people for sometime now that I would write an article on Zwarg reels. I recently met a subscriber who reminded me of this and that he was desperate to learn as much as possible about the reels. On further questioning I managed to find out that he had been offered a small collection of these reels, more questions and probing and suddenly I might be offered one of the reels. So here we go! Otto Max Zwarg was born in Berlin, Germany in 1899. After completing his basic education he trained as a dentist and, sometime in late 1922 – early 1923, he emigrated to the United States. However in order to practise his profession in America he would have had to have taken supplementary qualifications. His wife and newly born daughter were still in Germany, presenting the young Otto with a problem. Should he try and gain the additional qualifications to work as a dentist, thus delaying the arrival of his family or take temporary work and bring his family over immediately? He would then be able to gain his qualifications at leisure. He chose the later and gained employment with a company started by another German born immigrant Edward Von Hofe. His wife and daughter arrived in America in December 1923 and such was his love of the temporary work that he had undertaken that he never practised dentistry. He eventually rose to be head of reel production at the Vom Hofe Company, a position he held until the company went out of business in 1940. Otto purchased the tools and dies of the Vom Hofe Company along with other equipment and various spares. From 1940 until 1946 there are some gaps in the biography, partially due to the fact that he was employed in defence work. The Norden bomb sight was a top secret project during W.W.II and whilst he laboured on this during the day, evenings would be spent working on fishing tackle. In particular he would repair and renovate the Vom Hofe reels as well as manufacturing split cane fishing rods. In 1946 he was making reels under his own name from premises in Brooklyn New York. He had been joined by three new directors who not only encouraged and assisted him in setting up the company but also persuaded him to relocate to Florida. The idea was to build a fishing lodge that would be set up in the Maximo Point area of St. Petersburg catering for wealthy sport fishing enthusiasts. They would come to buy the high quality reels made by Zwarg, and also to take part fishing in an area with a renowned sporting reputation. 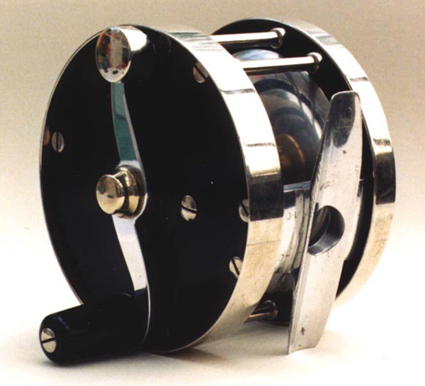 The Zwarg reels were intentionally not mass produced, as the directors decided that custom built reels were more valuable and suited to the exclusive nature of the new venture. Dorsey Whittington was president of the Otto Zwarg Co., Inc., and was also a world famous concert pianist. He started fishing as a young boy on Catalina Island in company of such famous fishermen as Zane Grey and Charles Holder. He followed the tradition of the Tuna Club and was an advocate of using light tackle, not only around Catalina Island, but in Europe as well. 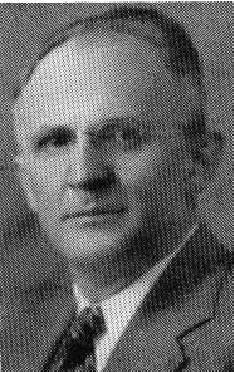 Eugene G. Fitzgerald was the Vice President of the company and the Southern Sales Manager of the L. G. Balfour Company. Well known as a sportsman with not just with the rod but also the gun and, like Dorsey, an advocate of fishing with light tackle. William G. Pforr also Vice President was distributor for the Zwarg Company in the New York area and eastern U.S.A. He also worked as Sales Manager for the L. G. Balfour in the New York area and was another angler of repute. Otto’s wife Martha was the company secretary, but not a stockholder. Another investor would join the company once the move to Florida was completed. This stockholder was Oscar Steinert a wealthy builder and fisherman who rented Otto premises at 635 First Avenue South. These were originally intended to be temporary until the lodge was built (but the planned lodge never materialised!). So in 1947 the company was set up in Florida and in June the catalogue was issued. Whilst working for the Edward Vom Hofe Company, Otto would have been making more than twenty different models of reels – for his own company he chose three. 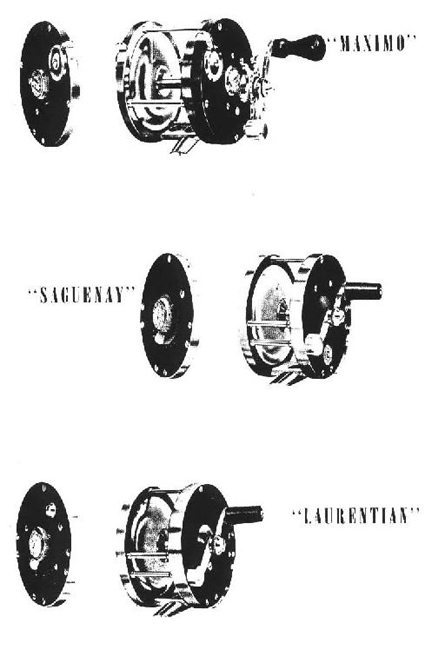 These three reels were the model 300 Saguenay, model 400 Laurentian and model 500 Maximo. They were based on the Vom Hofe Restigouche, Tobique and the Universal Star models. They were available in sizes 1/0, 2/0, 3/0, 4/0, and 6/0 just like the Vom Hofe reels. These sizes corresponded to 3 1/8 , 3 3/8 , 3 5/8,, 3 7/8, and 4 ¼ inches. He did make two sizes that were not catalogued the 9/0 and 12/0 Maximo reels. This is a little strange as there is a picture of him working on a 12/0 Maximo in the catalogue. The Saguenay and the Laurentian were named after the two well known salmon rivers in Canada. The Maximo after Maximo Point on the south western most point of St. Petersburg where the lodge was going to be sited. Maximo Point was named after Antonio Maximo who established a “fish ranche” there in 1843. 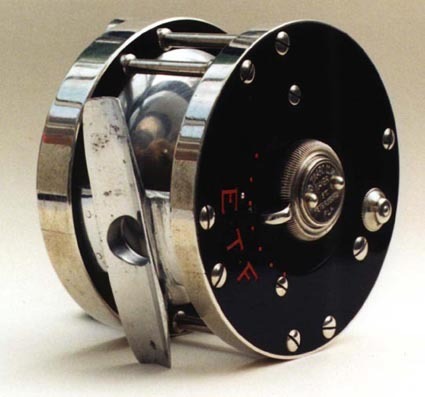 The Laurentian was a 2:1 multiplying reel exactly like the Vom Hofe Tobique. The reels were made from ebonite or hard rubber, nickel silver rims, S shaped counterbalanced handles and Tobin bronze bearings. The oversized gears were also made of bronze, with the centre of the axle containing a crucible steel drill rod forming the pivot. Although the reels were machine made they were assembled by hand and the countersunk screws were hand cut. Like the Vom Hofe reels the oil cap was a sliding disc. Otto Zwarg also offered special presentation reels consisting of 10K solid gold or silver name plate inset into the reel. This service cost $50 for the gold and $45 for the Sterling silver including engraving. In addition to making his range of reels he offered a reel repair service specialising in Edward Vom Hofe reels. In the 1947 catalogue there is a letter from Edward Vom Hofe’s son Edwin endorsing the activities of Otto Zwarg. The company also offered to refurbish split cane rods by removing the old varnish, replacing the guides and re-whipping the rod with new silk thread. Like many people previously he numbered his reels and reputedly kept a record of every reel made, however this log has not yet turned up. This numbering system has helped in dating the tackle that he made. 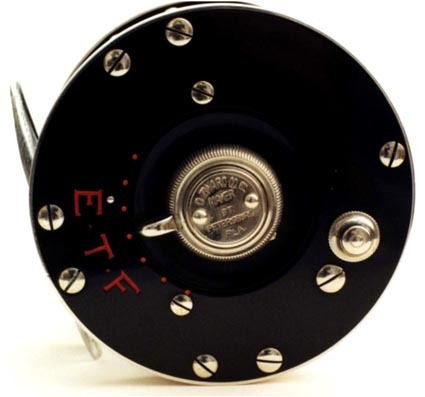 Some reels have even turned up with just the letter “Z” on the oil cap and have been sold as prototypes. I do not believe that these reels were prototypes, merely early made reels produced at a time when the company’s trading style had yet to be established. Size 1/0 Model 400 Laurentian reel. In the spring of 1958 Otto Zwarg suffered a fatal heart attack whilst walking in St. Petersburg. With his death reel making ceased, although some reels have appeared with the letter “N” for 1959 and “O” for 1960. I believe that these reels were not made after his death they were made whilst he was alive and sold later. In 1955 the company was advertising as a maker of “precision parts, dies and tools for the electronic field. Models, tools and dies for precision instruments”, no mention of fishing tackle. It is conceivable that reel production had totally ceased prior to this year as it was just not profitable, and that reels with the “J” prefix and all subsequent reels were just taken from stock and merely stamped when sold. Some may question Zwarg’s position as a great reel maker due to the fact that he only produced three reels during his life time, and that he merely copied proven models invented by his former employers Vom Hofe. If we look at the time he was making reels in his own right it was from 1946 – 1955 eleven years. We can only speculate what would have happened had he been in business on his own from the 1930’s. What is certain is the fact that with only 11 or 14 years of production the reels are scarce and much sought after. I know a few collectors who have been buying his reels for more than twenty years. There are only three models in five sizes, fifteen reels plus the two uncatalogued Maximo reels in total seventeen, not such a daunting task to complete a collection? I know nobody who has a complete set. The Laurentian size 1/0 is an exceptionally rare reel that I bought at Neil Freeman’s auction in London in April 1998 for £2,400 – I had never seen this reel before or since. It is the same with the other two models in the smaller sizes – they are in great demand. What I do know is that some people still use his reels to fish with today, preferring the “chunkier” construction of his reels over the Edward Vom Hofe ones. Otto used aluminium on his reels to lighten them without any loss of quality, whereas the Vom Hofe reels with aluminium look cheap and are generally associated with the substandard reels produced at the Philadelphia address. One regret is that he never produced a range of trout reels, or a very large big game reel. Still never mind we cannot have everything and at least we do have examples of his work. This entry was posted in Otto Zwarg. Bookmark the permalink. stumbled on this apparently long awaited article, written by a knowledgable enthusiast. I marvelled at the pictures; surely there must be more material, either exploded views, or pictures showing the collection, or even the mechanics. But, indeed, “… we cannot have everything..”. Do continue as a good custodian of a small niche in the world of excellently crafted chunky reels. Many thank yous. Many years ago I was given a reel by a friend, but I have never used it. It is enscried “O. Zwarg St. Petersburg” and is stamped O131. It appears to be a Maximo model 600 and has a leather thumb brake. The spool width is 2 inches at maximum. It was used for deep sea angling here on the gulf coast. Your assistance with its identification will be greatly appreciated. Can you provide an estimate of what various Otto Zwarg reels are worth if selling in today’s market? I know, of course, that the value depends heavily upon the condition it’s in, and where it was manufactured.